Tooth whitening is a simple way to brighten the colour of teeth without damaging the teeth in any way. 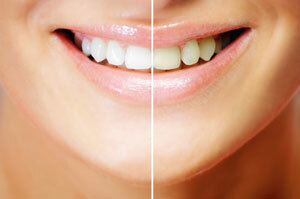 There are two ways to carry out tooth whitening. It can be carried out in the surgery in a one hour treatment, using a special light to improve the efficiency of the whitening agent. This method has the advantage that the treatment is carried out all in one session. Alternatively whitening can be carried out at home usually over a two week period using specially constructed covers over the teeth. The advantage of whitening teeth this way is that there is less sensitivity, and the whitening of the teeth can easily be ‘topped up’ at later dates. For the best result, a combination of both of the above treatments is recommended.